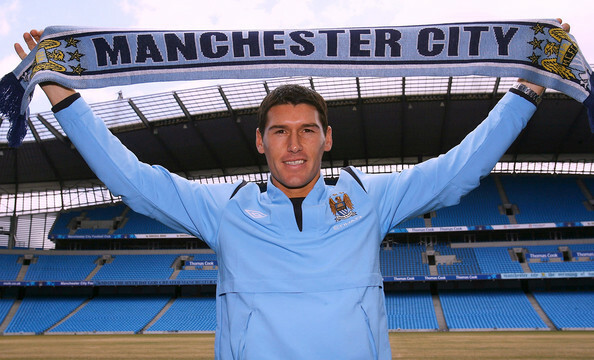 Gareth Barry has recently come out and defended his move to Manchester City, as fans and media alike have continued to crucify him for leaving Villa. He’s being portrayed as a traitorous player who has abandoned his boyhood (joined when he was 18) club for a fatter paycheck – the ultimate ‘no no’ for English football and its fans. Rafa Benitez, who was in hot pursuit of the player last summer (lest we forget), sums up the feelings of the press and fans quite nicely as he labelled Barry a “mercenary” and accused that money was the only reason behind his decision to move. Everybody (especially Rafa) sounds a bit bitter to me. And here’s why. First of all, this is a World Cup year. Players need to be playing week-in-week-out in their strongest positions to have a chance of impressing the England manager, who has yet to find his first-choice starters (Barry’s preferred position is central midfield). So, if Barry were to join Liverpool, where would he play? Gerrard certainly won’t be displaced and he just signed a new deal. He’s not going anywhere for a while. Alonso and Mascherano are both world-class players and although both have attracted attention from Spain (Real Madrid and Barcelona, respectively) , Rafa has been adamant that they are staying put. So, where does Barry fit in here? Does anyone think he could displace Alonso or Mascherano for an extended period of time? Didn’t think so. At Manchester City, he will have a starting place in the most exciting squad of the Premier League. You may wonder how this is possible when they’ve added Santa Cruz, Tevez, and Adebayor? Well, it is clear with these signings that Hughes will attempt to play a 4-2-3-1 formation next season. That is, 1 out-and-out striker and 3 support strikers behind him (are the transfers beginning to make sense now?). Behind them are two holding midfielders, and this is where Barry will fit in. He’ll slot in next to Stephen Ireland and look to pull the strings of one of the best strikeforces in the world. This is a position any player would dream of. And why can’t this team challenge for top honors? They’ve got a great manager, great players and the owners aren’t done spending yet. If they strengthen their defense (bids for Terry and Lescott show that these owners aren’t completely bonkers), they will have the tools to break into the top 4 and beyond. This time next year, they could easily be in that Champion’s League spot that Villa have been chasing for years. I mean, who do you think has a better chance of breaking the top four – Aston Villa or Manchester City? Now that the important things are out of the way, let’s touch on the subject of numbers. First, Aston Villa fans should be happy that they got £12 million for a player that would have gone for nothing at the end of next season. Second, it’s not Barry’s fault that Villa didn’t agree to terms with Liverpool the previous summer. 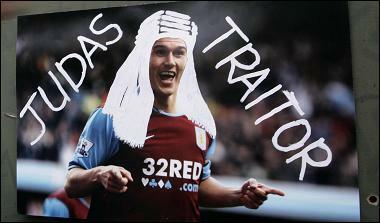 Third, Barry’s spent 12 years at Aston Villa. To be fair to him, he’s paid his dues to the club, and feels that he’s advanced his career with them as far as it will go. He has earned the right to move on. Villa have been flirting with the top 4 for a while, but they lack the strength, depth and quality to sustain a challenge for a full season. City are clearly the team to be at – doesn’t the prospect of playing (starting) with Robinho, Tevez, Santa Cruz, Adebayor, etc justify a move? Oh, and don’t blame him for his wages (£100,000 per week), blame the owners. And finally, are you telling me that you wouldn’t take the money to play for a team with such potential next year? I’d take a lot less. This entry was posted on Sunday, July 19th, 2009 at 5:42 am and is filed under Footy. You can follow any responses to this entry through the RSS 2.0 feed. You can leave a response, or trackback from your own site. 4 Responses to Barry the Traitor? I feel as though the 4-2-3-1 formation you mentioned would get railroaded by teams with a strong midfield. Barry and Ireland (who isn’t a defensive mid), would be the only thing between a central midfielder and the back four, which, like you say still needs an upgrade. I feel three strikers at a time would be the most Hughesy could get away with. 4 at once is begging other teams to counter attack. i’m not saying it will work – it’s just what they’re probably going to do with the players they’ve got/purchased. still think liverpool is a better option, in terms of history and winning medals. plus, theres champions league football. the 4-2-3-1 formation does sounds logical but teams are more prepared for their oppositions nowadays, other teams will have a gameplay to counter that formation. where will the 4 strikers fit when theres a need to change formation mid-game? Nice article. It’s a tough one. I don’t blame Gareth Barry for moving on. Manchester City is an exciting prospect. Personally I believe Xabi Alonso and Javier Mascherano are both stronger then Barry. Though in some respects Gareth Barry has dug his own grave by stating last year he wanted to leave Villa to play champions league football with Liverpool. I am eagerly awaiting how Mark Hughes manages to squeeze all the talent purchased this summer into one team and make them an efficient unit.